WNYC-FM (93.9 MHz) is a non-profit, noncommercial, public radio station licensed to New York City. It is owned by New York Public Radio along with WNYC (AM), Newark, New Jersey-licensed classical music outlet WQXR-FM (105.9 MHz), New Jersey Public Radio, and the Jerome L. Greene Performance Space. New York Public Radio is a not-for-profit corporation, incorporated in 1979, and is a publicly supported organization. The station broadcasts from studios and offices in the Hudson Square neighborhood of Manhattan. WNYC-FM's transmitter is located at the Empire State Building. The station serves New York metropolitan area. WNYC-FM began regularly scheduled broadcasts on the FM band on March 13, 1943 at 43.9 MHz as the sister station to WNYC. Known originally as W39NY, the FM outlet adopted its present WNYC-FM identity and its present frequency of 93.9 MHz within a few years. In 1961 the pair were joined by a television operation, as WUHF (channel 31) took to the air in an experimental format. The following year the station was renamed WNYC-TV. The station's ownership by the City meant that it was occasionally subject to the whims of various mayors. As part of a crackdown on prostitution in 1979, then-Mayor Ed Koch tried to use WNYC to broadcast the names of "johns" arrested for soliciting. Announcers threatened a walkout and station management refused to comply with the idea; after one broadcast the idea was abandoned. See John Hour. Shortly after assuming the mayoralty in 1994, Rudolph W. Giuliani announced he was considering selling WNYC-AM-FM. Giuliani believed that broadcasting was no longer essential as a municipal service, and that the financial compensation from selling the stations could be used to help the City cover budget shortfalls. The final decision was made in March 1995: while the City opted to divest WNYC-TV (now WPXN-TV) through a blind auction to commercial buyers, WNYC-AM-FM was sold to the WNYC Foundation for $20 million over a six-year period, far less than what the stations could have been sold for if they were placed on the open market. While the sale put an end to the occasional political intrusions of the past, it required the WNYC Foundation to embark on a major appeal towards listeners, other foundations, and private benefactors. The station's audience and budget have continued to grow since the split from the City. The terrorist attacks of September 11, 2001 destroyed WNYC-FM's transmitter atop the World Trade Center. WNYC-AM-FM's studios, in the nearby Manhattan Municipal Building, had to be evacuated and station staff was unable to return to its offices for three weeks. The FM signal was knocked off the air for a time. WNYC-FM temporarily moved to studios at National Public Radio's New York bureau in midtown Manhattan, where it broadcast on its still operating AM signal transmitting from towers in Kearny, New Jersey and by a live Internet stream. The stations eventually returned to the Municipal Building. 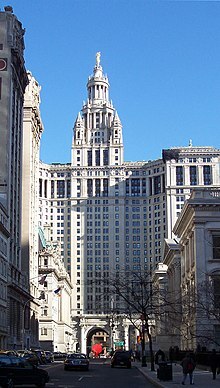 On June 16, 2008 NYPR moved from its 51,400 square feet (4,780 m2) of rent-free space scattered on eight floors of the Manhattan Municipal Building to a new location on Varick Street, near the Holland Tunnel. The station now occupies three and a half floors of a 12-story former printing building. The new offices have 12-foot (4 m) ceilings and 71,900 square feet (6,680 m2) of space. The number of recording studios and booths has doubled, to 31. There is a new 140-seat, street-level studio for live broadcasts, concerts and public forums and an expansion of the newsroom of over 60 journalists. Renovation, construction, rent and operating costs for the new Varick Street location amounted to $45 million. In addition to raising these funds, NYPR raised money for a one-time fund of $12.5 million to cover the cost of creating 40 more hours of new programming and three new shows. The total cost of $57.5 million for both the move and programming is nearly three times the $20 million the station had to raise over seven years to buy its licenses from the City in 1997. On October 8, 2009 WNYC took control of classical music station WQXR-FM, then at 96.3. WQXR's intellectual property (call letters and format) was acquired from the New York Times Company as part of a three-way transaction with Univision Radio. WNYC also purchased the 105.9 FM frequency of Univision's WCAA (now WXNY-FM). WQXR-FM's classical format moved to 105.9 and WXNY's Spanish Tropical format debuted at 96.3. The deal resulted in WQXR becoming a non-commercial station. With WQXR as a co-owned 24-hour classical station, WNYC-FM dropped its remaining classical music programming to become a full-time news/talk station. Past WNYC radio personalities include H. V. Kaltenborn, who hosted radio's first quiz program on WNYC in 1926, the Brooklyn Daily Eagle's Current Events Bee, a forerunner to shows like National Public Radio's Wait Wait... Don't Tell Me! In its early years the station lacked funds for a record library and would borrow albums from record stores around the Manhattan Municipal Building, where its studios were located. Legend has it, a listener began lending classical records to the station and in 1929, WNYC began broadcast of Masterwork Hour, radio's first program of recorded classical music. Margaret Juntwait, an announcer and classical music host at WNYC for 15 years, left for the Metropolitan Opera in September 2006. Prior to her death in 2015, Juntwait served as announcer for the Met's Saturday afternoon radio broadcasts, the first woman to hold the position and only the third regular announcer of the long-standing broadcast series, which was launched in 1931. John Schaefer, a music show host at WNYC for 20 years, has written liner notes for more than 100 albums, for everyone from Yo-Yo Ma to Terry Riley and was named a "New York influential" by New York magazine. WNYC produces 100 hours a week of its own programming, including nationally syndicated shows such as Studio 360, On the Media, Selected Shorts and Radiolab, as well as local news and interview shows that include, Soundcheck and The Brian Lehrer Show. The entire schedule is streamed live over the internet and several shows also air over Sirius and XM Satellite Radio. As a result, the station receives listener calls from far-flung states and even has international listeners. WNYC-FM broadcasts the major daily news programs produced by NPR, including Morning Edition and All Things Considered, as well as the BBC World Service and selected programs from Public Radio International including This American Life and A Prairie Home Companion. In 2013 WNYC launched The Jonathan Channel, a 24-hour streaming Internet radio station programmed by Jonathan Schwartz and dedicated to popular standards from the "Great American Song Book." The channel also featured live programming hosted by Schwartz, including a simulcast of his Sunday show on the station. The program was terminated upon Schwartz's December 2017 firing for sexual harassment allegations, along with longtime mid-morning fixture Leonard Lopate. ^ "2013 Income Tax Returns" (PDF). ^ "New York Public Radio". ^ "New York Public Radio Financial Statements and Supplemental Schedule" (PDF). ^ Deerwester, Jayme (21 December 2017). "WNYC hosts Leonard Lopate, Jonathan Schwartz fired". USA Today. Retrieved 17 September 2018. This page was last edited on 12 April 2019, at 06:23 (UTC).